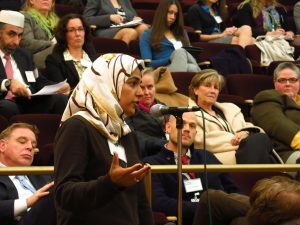 The Council sponsored four half-day forums between 2006 and 2013, each providing a “deep dive” into an aspect of U.S. public diplomacy. The Honorable Evan Ryan, Department of State Assistant Secretary for Educational and Cultural Affairs, and Macon Phillips, the Department’s Coordinator of International Information Programs, offered keynote addresses. Three panels of scholars, practitioners, and leaders from the nonprofit and media sectors discussed the historical foundations of U.S. PD, the impact of the September 11 attacks, and future changes to the field. The program included a salute to veterans of the U.S. Information Agency (USIA), the Voice of America (VOA), and the Soviet Exhibitions program. A parallel project can be viewed online: Telling America’s Stories, a collection of still images showing the people and the programs of public diplomacy drawn from public and private archives. Ambassador Thomas Shannon, U.S. Ambassador to Brazil at the time, delivered the keynote address. Two panels of veteran U.S. field officers reflected on their experiences in engaging with audiences in the Muslim world and with young audiences around the globe. Two panels of speakers shared viewpoints and ideas about how to strengthen U.S. public diplomacy efforts worldwide for the consideration of the new Obama Administration. You’ll find a full sampling of each Forum’s presentations in the book which it inspired. See our Books page for more information.